Our Dark Tales: Edgar Allan Poe's The Gold Bug Walkthrough is the perfect detective's dossier on helping you locate the lost treasure of Captain Kidd and sooth LeGrand's biting obsession. In this Dark Tales Walkthrough, you'll find a treasure trove of vital information including custom screenshots, solutions to mini-games and puzzles, as well as detailed instructions to help you crack the code on this classic twist of the famed short story by Edgar Allan Poe. Thank you for joining us at the Dark Tales: Edgar Allan Poe's The Gold Bug Walkthrough, where you'll discover an expert detective's tool kit to help you solve the mystery of Captain Kidd's treasure. We've compiled tons of custom screenshots, solutions to all the puzzles and mini-games you'll encounter, as well as detailed step-by-step instructions on how to beat the game from start to finish so you'll have no problem tracking down the criminals intent on finding the treasure first. We hope you enjoy our Dark Tales: Edgar Allan Poe's The Gold Bug Walkthrough. In Dark Tales: Edgar Allan Poe's The Gold Bug join your partner Dupin and the obsessed LeGrand in this twist on a classic Poe short story as you become embroiled in a search for the lost treasure of Captain Kidd. But you're not the only ones after this secret booty. Can you avoid the masked man and the mysterious woman who seem hell-bent on stealing your secrets and find the treasure before they do? 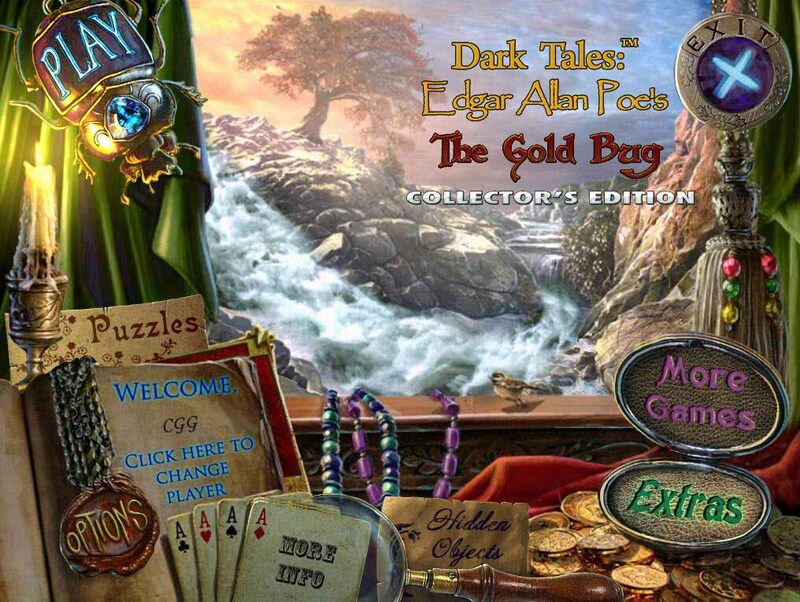 With our Dark Tales: Edgar Allan Poe's The Gold Bug Walkthrough as your compass you can! Difficulty Settings - There are three difficulty settings: Casual, Advanced, and Real Detective. Casual mode is for players who want a more relaxed feel to gameplay; hint and skip buttons recharge quickly and sparkles will indicate active areas. Advanced mode is for players looking for a bigger challenge; skip and hint buttons charge slowly. There are no sparkles to indicate active areas. Real Detective Mode is for professional players; the skip and hint buttons charge very slowly; there are no sparkle hints and black bar tips are disabled. You can change your difficulty level in the options screen. Notebook - The notebook will glow when there is a new entry. Click n the notebook in the lower left hand corner of your screen to read it. It will store all the important information and clues you will discover during gameplay. Hand Cursor - When your cursor turns into a hand, it means you can pick up an item and add it to your inventory or interact with an item in some way. Eye Icon - When your cursor turns into a eye, it means you can zoom into an area to get a better look or it will allow you to interact with characters you may meet along the way. Arrow Pointers - These will appear when you are able to move to another screen. Click on it to move. Hints - Hints can be found in the lower right hand corner of your screen. Click here if you're stuck. Just remember, these take time to charge before you can use it again depending on what difficulty setting you are playing on. Inventory - Your inventory can be found at the bottom of the screen under the tab marked Inventory. Just hover your mouse over that area to bring it up. Click on the padlock in the corner to lock it in place. Paw Print - When the dog Arthur can help you in a scene, a paw print will appear on an object in your inventory. Click on the object and drag to the image of Arthur in the bottom right hand corner of your screen. Hidden Object Scenes - Hidden Object Areas will sparkle. Objects in the scene will be listed as a silhouette. Each item you find can be used in another way in the scene to find another object. Some items will be hidden. Keep an eye out for when your cursor turns into a hand to interact with part of the screen. And that's the basics for playing Dark Tales: Edgar Allan Poe's The Gold Bug! Good luck! 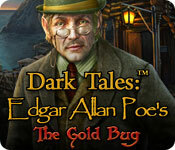 And we hope you enjoy our Dark Tales: Edgar Allan Poe's The Gold Bug Walkthrough!